Hidden on a small sidestreet off Gammel Kongevej, you’ll find one of the staples of late night drinking in the Frederiksberg part of Copenhagen. This local bar is open everyday from 22:00 and closes at 06:00 the earliest; often it stays open a bit longer if the atmosphere is good and people are still drinking. 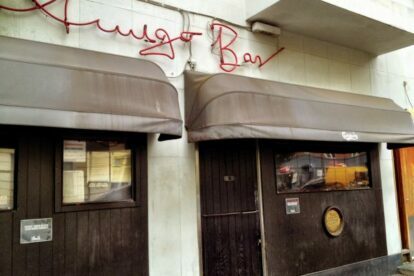 Amigo Bar used to be a gay-and-lesbian-only bar but the cosy atmosphere has attracted so many straight people that most nights it doesn’t particularly seem like a gay establishment. It is however still very gay-friendly and everyone is welcome. Well, maybe apart from the large number of songs played on the jukebox originating from the Eurovision Song Contest. The drinks are reasonably priced, the music is loud enough to dance but not too loud to talk and smoking is allowed. All in all it makes for very enjoyable night out and it’s one of my favorite places to continue the night when nearby Salon 39 (check the article) closes at 01:00.